Cassava mosaic disease (CMD) is caused by various begomoviruses of the family Geminiviridae leading to considerable crop losses in Africa and Asia. Recombination between their genomic components has generated new pathotypes with enhanced virulence in Africa. 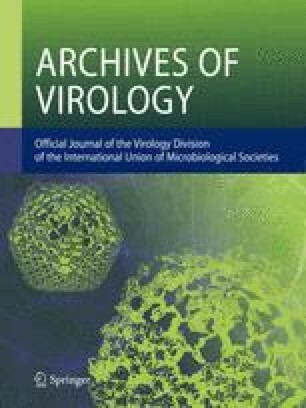 Here, we report about a survey on the biodiversity of begomoviruses in cassava from southern India (Tamil Nadu and Kerala states) performed in 2001 and 2002. Viral DNA A components from stem cuttings were analysed using polymerase chain reaction and restriction fragment length polymorphism. Eight representative examples were completely sequenced. The majority of DNA sequences (7 of 8) obtained were more closely related to that of Sri Lankan cassava mosaic virus (SLCMV) than of Indian cassava mosaic virus (ICMV). Only one sequence collected in Kerala was related to ICMV. The diversity of the SLCMV-like sequences was rather low compared to the variability of African viruses associated with cassava mosaic disease. Based on DNA A sequence data, all of these isolates should be classified as variants of SLCMV or ICMV. Phylogenetic analysis revealed mosaic structures within the DNA sequences which may indicate footprints of recombination events between ancestors of SLCMV and ICMV.